It's not easy designing a fair and playable game of asymmetrical warfare. But that's what we have here as lumbering tripods armed with devastating heat rays take on puny human forces. It's 1908. Earth has finally recovered from the terrifying shock of the Martian attacks of 1898 that nearly laid waste to London. While a few of the world's more cautious leaders, intellectuals, and industrialists call for continued vigilance and defense preparations against the possible return of the deadly mechanized Martian horde, most of the world has fallen back into complacency. Under the cover of this collective sleep, once more, Martian cylinders begin to fall from sky. This time, the Martians land in largely uninhabited areas of the globe, and this time they've inoculated themselves against the earthly microbes that proved their undoing in the first invasion. The second wave of the Great Interplanetary War has begun. 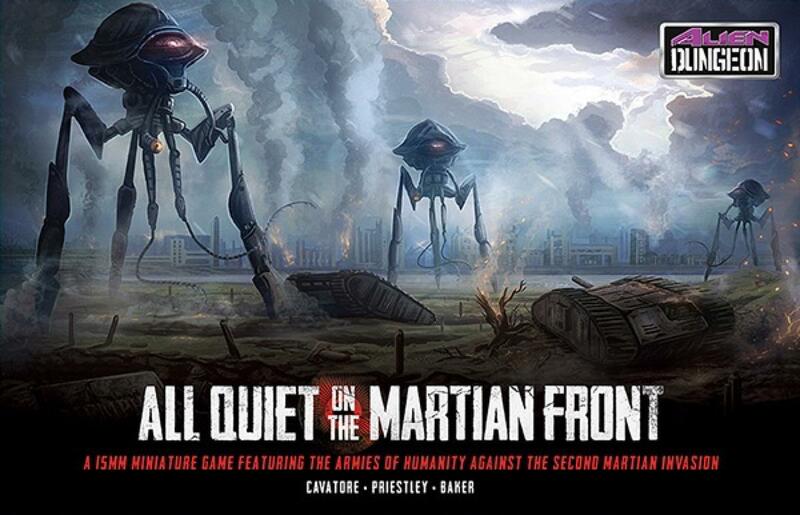 In 2013, I had the pleasure of backing a Kickstarter campaign for All Quiet on the Martian Front, a new tabletop sci-fi wargame based on the above brilliant take on the canonical HG Wells sci-fi classic. Launched by Ernie Baker and the folks at Alien Dungeon (previously known for the homicidal fairytale game Fantacide), the name, concept, and early prototype models for the game completely sucked me in. I've been locked into the Warhammer 40,000 universe and games for the past 15 years but have recently been in the market for a new game, one that's cheaper to invest in, quicker and easier to play, but with an engaging backstory (known as “fluff” in gamer parlance) that can really fire my imagination. I immediately suspected All Quiet on the Martian Front (AQMF) might be that game. By the time the rather thrilling KS campaign was over (amassing nearly $305K on a $50K campaign), and the provisional rules had been posted, prototyped models shown off, and games demo'd, I knew this was going to be my new favorite game. 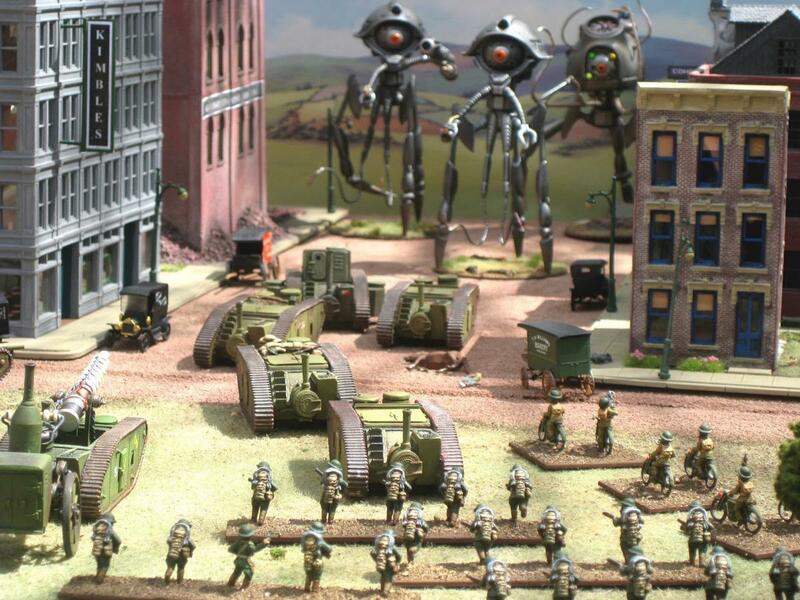 All Quiet on the Martian Front is a 15mm tabletop wargame where you get to play either human or Martian forces as the Martians attempt to conquer Earth. The game features an impressively well-written and envisioned background, top-shelf graphics and product production, laudable miniature design and manufacture (with plenty of plastics!) , and simple, yet engaging game mechanics. The game rules were principally designed by Rick Priestley and Alessio Cavatore, two of the best tabletop game designers on the planet. Priestley is primarily known for creating/co-creating Warhammer 40,000 (WH40K), Warhammer Fantasy Battles (WHFB), The Lord of the Rings Strategy Battle Game, Bolt Action, and most recently, Beyond the Gates of Antares. Cavatore has co-designed such tabletop titans as The Lord of the Rings Strategy Battle Game, Warmaster, Mordheim, Bolt Action, and key editions of WHFB and WH40K. With AQMF, it really feels like we're seeing them boiling down the best of what they've learned in designing an extremely playable fire & movement wargame that balances the fun factor with a strategically and tactically interesting conflict simulation. Ernie Baker, the man behind Alien Dungeon, contributed the core concept for the game, much of the believable, well-written fluff, and he shares rules credits. The basic rules structure is move-shoot-move. The second movement phase seems specifically designed to allow the vastly out-gunned human forces the ability to move back into cover or out of range from the Martian war machine. Players roll for initiative each turn, allowing for the possibility of one player getting multiple moves in a row. This definitely adds for some exciting (or depressing) moments, depending on what's at stake at any given turn. The use of stealth tokens allow the human player to move unseen, placing tokens, one of which indicates the actual placement of the human player's forces, depending on scenario. Again, this is a game mechanic clearly designed to give humans a sporting chance. It's not easy designing a fair and playable game of asymmetrical warfare. But that's what we have here as giant, lumbering tripods, armed with devastating heat rays, suffocating black dust, and corrosive green gas canisters take on appropriately puny human forces (they look so insignificant beneath those towering robotic legs). But there are enough vulnerabilities and exploits baked into the game to make it “fair” enough to keep things fun, playable, and tactically interesting. In the alternate history of the game, given the menace of the Martians, a Martian War Council is formed and the likes of Telsa, Edison, Marconi, Westinghouse, and Ford are basically given a blank check to create the most advanced weapons they can devise. This allows the human forces to field such formidable weapons as the Tesla lightning gun, a flame-throwing tank, and massive ironclad land ships — basically battleships on tread. AQMF has gotten some criticism, perhaps justifiably, for being a little too rote in gameplay, with not enough novelty and unique situations to keep things interesting and cinematic. The rules are fairly simple and there aren't too many variations or surprises in a game. But players must keep in mind that this is only the first edition. Take the terrifying barb-like reaper tentacles on the Martian tripod, for instance, which don't yet have a purpose in gameplay. You know they will come into play soon enough. 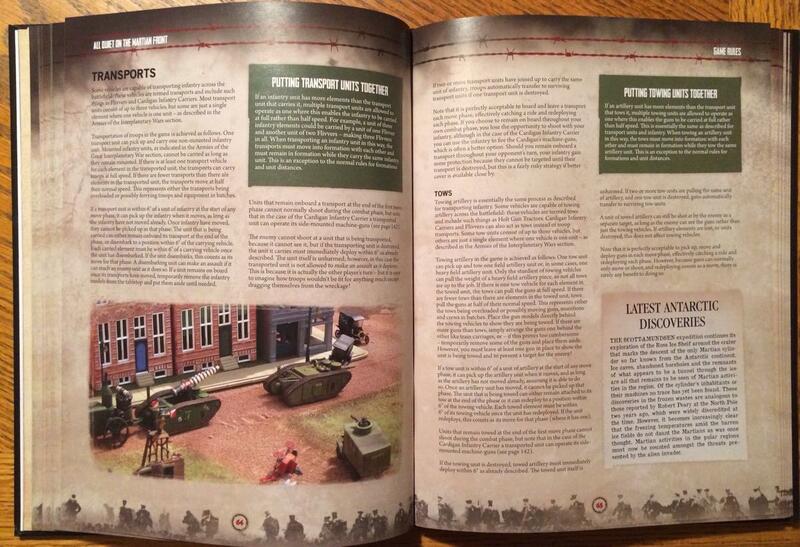 In this first edition, there are already a number of special unit actions and rules for things like the Rough Rider motorbike units of the human armies which can literally run rings (and steel cables) around the tripods to bring them down, or the brave Kamikaze-like Forlorn Hope teams which hide amongst their fellow doughboys, ready to fire their grappling hooks high onto a tripod to attempt to scale it and attach explosive charges to bring it down. It is these special maneuvers that make gameplay exciting enough and I suspect we'll see more of this in future supplements and rules revisions. Besides being excited by the concept and the fluff, I can't say enough about how impressed I am with the models themselves. It's astounding to think how the barriers to entry have lowered in the last few years to the point where a small, fairly unknown game company can produce such an impressive gamebook, starter set, and a fairly extensive and professional line of first-release models (with many of them in formerly cost-prohibitive plastic kits). The tripods, the steam tanks and artillery, the stands of infantry, the supply trucks and other support units, all of them are really decent, some downright impressive, sculpts and parts castings. And working in 15mm has been a revelation to me. This small scale is so much easier and quicker to work with than the 28mm modeling and painting I'm used to. People have been getting the AQMF starter set and painting up all of the models in the box (and even some additional models and scenery) in a weekend. This is a welcome change from 28mm modeling/gaming where, for instance, painting up a 2000-point WH40K army is a major undertaking. And, because 15mm is roughly scale-analogous to HO trains, you can use appropriate HO scenery for your All Quiet gaming table. I'm having a ball buying up early 20th century factories, farmhouses, train stations, wagons, etc. And it's all refreshingly cheap relative to the ridiculous prices of Games Workshop buildings and terrain. 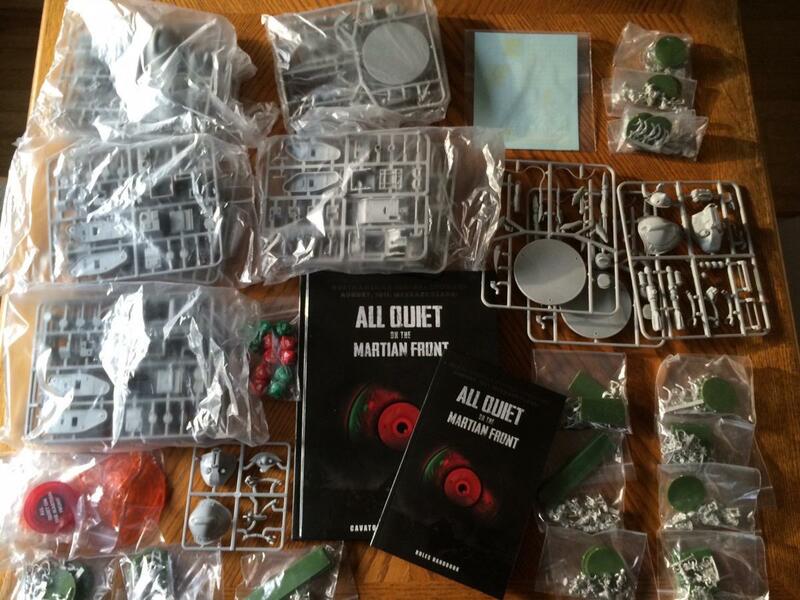 To get started, I recommend getting the All Quiet on the Martian Front Starter Game ($100). In the starter set, you get (on the US side) six steam tanks, three machine gun teams, three rough rider motorcycle stands, and six stands of 30 doughboy infantry units. On the Martian side, you get three Martian tripods with three possible weapons choices (heat ray, green gas, black dust launcher). You also get a 50-page mini rulebook, a template set (with rout, immobilized, barrage, damage, heat ray sweep, and hidden troop markers), and two 10-sided dice, a Start Here guide (basic model assembly instructions), and a decal transfer sheet. This is a great value for the money and all you really need to start playing the game and deciding if you want to get stuck in. If you want to splurge, you might also want to get the 176-page hardcover rulebook ($40). It's a really beautiful, slick rulebook, well-organized, filled with great art, compelling fluff, army lists for the Martians, US, and the British Expeditionary Force, and ten game scenarios in the back. 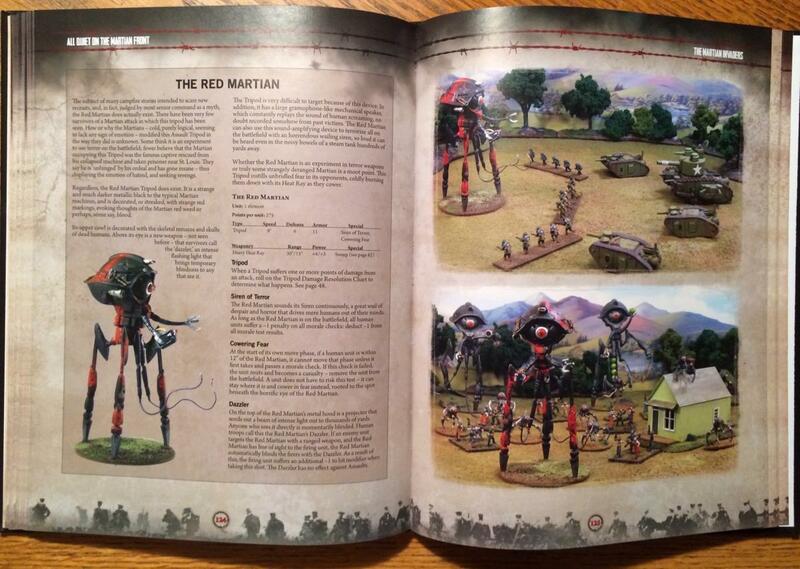 The rules for All Quiet on the Martian Front seem very scaleable, and with the reasonably-priced 15mil models, I suspect we'll see some massive games at cons. 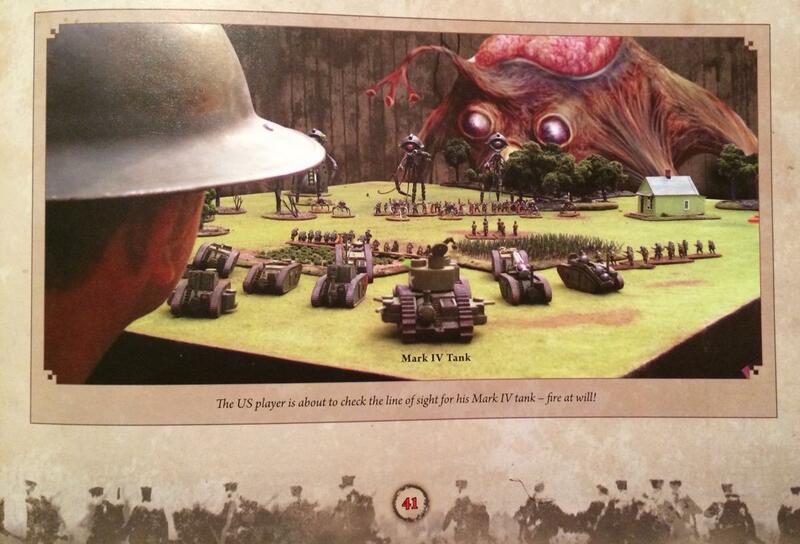 And, as the back page of the hardcover rulebook teases, it looks like we're on the verge of a full-on Great Interplanetary War, with moon men, Venusians, and Morloc-like “Underdwellers” soon entering the fray. And we'll see human counter-measures of aircraft, more devastating land ships, and whatever other massive weapons of war Tesla, Edison, and Westinghouse can devise. I for one, can't wait to see where this game goes. Pass me my doughboy helmet, my gasmask, my grappling hook, and my carbine – I'm going over the top! It was a happy day when the hefty box arrived with my AQMF Kickstarter rewards. I got all of this (and more that followed a month later) for a mere $100 pledge. 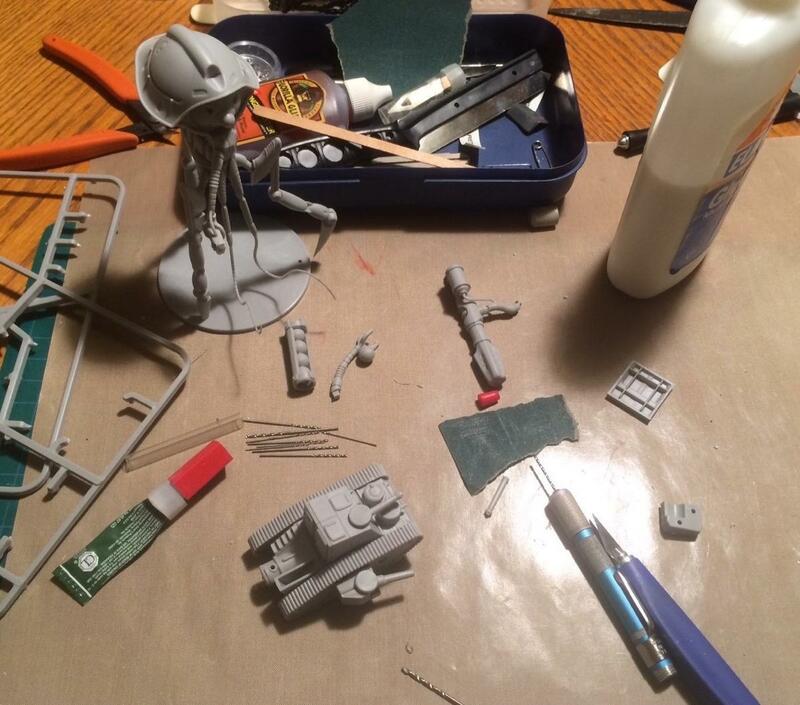 I'll be busy modeling and painting all this stuff for awhile. Here I am modeling one of the very nice Martian plastic tripod kits and one of the steam tanks. The Starter Set comes with three pods and six tanks.